Put some sunshine into your holidays with one of our beautiful, well-equipped campervans with plenty of clever features and storage. Perfect for mini breaks, weeks away and everyday use. We have luxurious hand crafted, Jöbl Design Campervans ready and available to hire in 2018. We can also cater for your four legged friends with our pet-friendly campervans for hire! Addhire, in association with Jöbl brings you a unique try before you buy offer on our fantastic campervans, giving you the chance to test drive the latest Campervan before you buy. 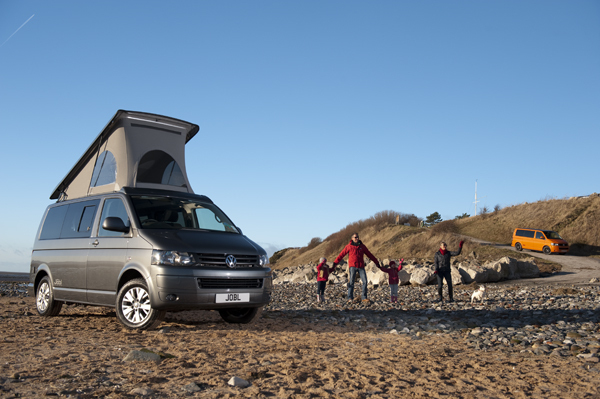 If you hire one of our VW Jöbl Campervans for 4 nights or more, love it and then proceed to purchase a new Jöbl Campvervan, we will refund up to one weeks full rental fee back to you. *£75 per night from 1 October to 31 March annually. £100 per night thereafter.